Before skiing (or any sport) it’s essential to prepare your body for the sport it’s about to do. This is particularly important with skiing as we generally go from being cold and static to skiing at a high intensity and having to exert and stress our muscles to a high degree with no preparation in between. Below is a dynamic warm up routine that will get your body and muscles warm and ready for the effort it’s about to be put through during the day! 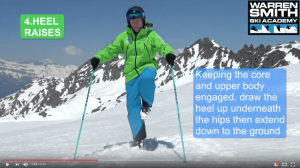 By running through this short routine at the beginning of every day the chances of injury decrease dramatically and your skiing potential is reached quicker and easier.